Johnny Cash’s song, “I’ve Been Everywhere”, sums up my summer vacation pretty well. I have been on the road for six of the past eight weeks. I have logged over 4,000 miles on the road and nearly as much through the air. I have been in 13 states and have worn through two pairs of running shoes. Thought I’d take a moment to share a bit of my adventure. Tahlequah High School will be implementing the Project Lead The Way (PLTW) Engineering program starting this fall, so my travels took me to Auburn, Ala. for PLTW training. I spent two weeks working with teachers from around the region as we took on the role of student again in preparation for leading our classrooms this fall. From stretching our artistic skills in the 2-dimensional world to the digital 3-D world we were challenged to create and problem solve in a way that I’m excited to share with my students. From Alabama to Michigan, I met with my family for some much needed vacation time before heading off to Denver for the Education Commission of the States (ECS) National Forum. The State Teachers of the Year were invited guests of ECS to spend a few days with various policy makers. It was a great experience to share our teacher voices and firsthand experiences with a goal of creating better education policy. I had the privilege of not only attending a portion of the Oklahoma State Department of Education’s EngageOK conference in July, but also being present to congratulate the 2016 Oklahoma Teacher of the Year finalists at their official announcement. It was an honor to meet and share with each of them, as they are all great examples of exemplary teaching within our state. 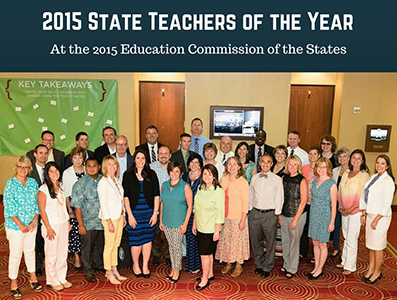 I look forward to seeing who will be the 61st Oklahoma Teacher of the Year in August. The selection committee has a tough job ahead of them. 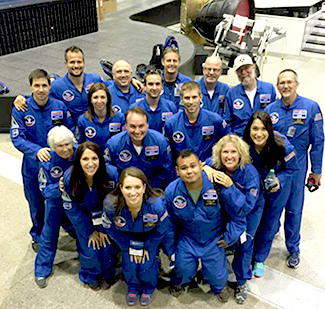 This past week was spent in Huntsville, Ala. at the U.S. Space and Rocket Center, where I participated in the International Educator Space Camp. Members of the 2015 State Teachers of the Year class as well as educators from Austria, Australia, Belgium, Germany, Greece, India and Norway were in attendance. 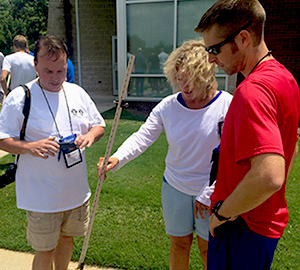 We spent the week immersed in a program that promotes STEM with hands-on activities. We were also able to try out some astronaut simulators as well as participate in some missions that focused on teamwork, leadership and decision-making. Similar to my PLTW experience, it was another reminder of what it is like to be a student again, feeling like you are completely lost while learning new material. My summer has taken me literally everywhere. Though, throughout all of my travels there has been one consistent reminder: great teachers are not hard to find. This summer will be memorable for a variety of reasons, but mostly due to the amazing educators that I was fortunate enough to meet along the way. I have learned much and have found a greater appreciation for the larger TEAM that we are all a part of when we join this profession. Over the next few weeks I hope to share some of my reflections on my OKTOY experience as well as try to rest up a bit before the new school year begins.